FIVE STAR CROOKS – a raw rock band, in the Aussie tradition of AC/DC, Rose Tattoo, The Angels and Jet. 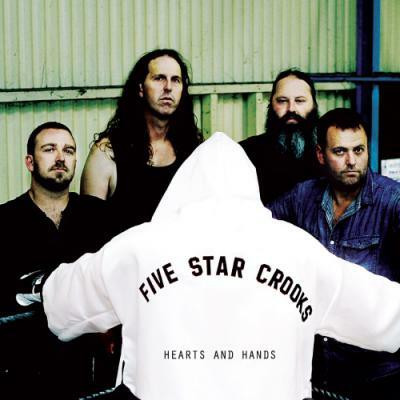 Coming from the outer eastern suburbs of Melbourne, Australia, Five Star Crooks released their debut album, ‘Hearts and Hands’, via the independent label ‘Hel Bel Records’ on the 30th April, 2014. The renowned sound engineer Bill Irvin has produced a dynamic album, from the literal stomp of ‘Lady Teacher’ and ‘No Risk, No Reward’, to the emotive and ambient tracks, ‘Heart’ and ‘Going Away’, with endless stirring rock in-between. Vocalist Pete Burgess soulful, husky voice leads the Rich Anderson guitar attack, driving bass of Nik Brajkovic and big beats of Travis Venn, with 70’s rock influence shining through in their music.